Do you remember the story about the very hungry caterpillar? I read it to my niece yesterday. 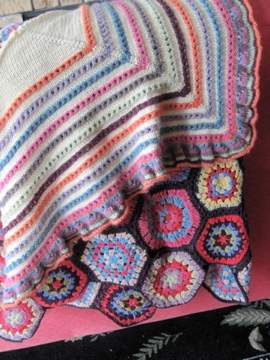 The colors in the book reminded me of the colors in the shawl I'm working on. Did I ever mention I was a third grade teacher? I think that is one of the reasons I love old children's books so much. A beautiful butterfly. Isn't that how it goes (when we are lucky) with knitting. You take those balls of yarn, follow your pattern, knit, knit, knit and you might just end up with something beautiful. The pattern is Stipes of Betsy by Amanda Rios. You can buy it on Ravelry. It was amazingly written and sooooo much fun to knit. I finished it in the blazing sun at a soccer game. Can't wait to cozy up to it when it is cold. While I'm on the subject of caterpillars... check out this cute stuff. What mom of a one year old has time for this?! This cake couldn't be cuter... Have a happy day everyone! Beautiful shawl and the little yarn bugs and butterflies are so creative! Thanks for linking up to Share the Love Wednesday! Cute !!! You are very creative !!! Speaking of catepillars , check out my blog , I just posted a sweet photo of a cake , with a catepillar on it !Found you via the link up with Share The Love ! 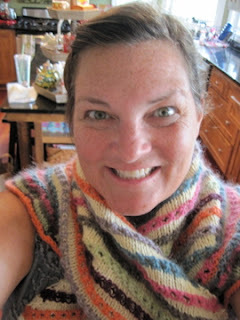 Pre4tty shawl but I really love your blog. The kids on the sidebars look so cute. Love Ravelry too.